Handbags are mysterious to men and profane to their mistresses. They are an accessory for almost every woman, whether young or matured, Christian or Buddhist, rich or poor, modern or conservative. They are universal and at the same time very personal, even intimate. Peeping in one’s bag or borrowing might be acceptable but not encouraged and only trusted friends and close relatives are allowed to do so, mostly under the owner’s control. Handbags are powerful icons and heroines of modern times stand behind ‘IT bags’ as godmother. 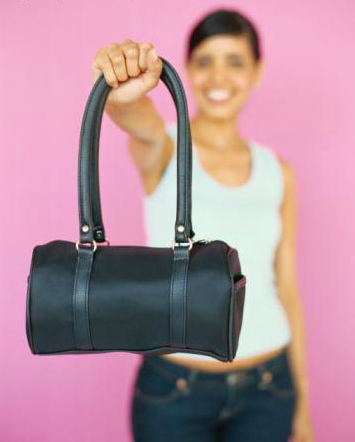 Why are handbags so important? Many women strongly identify with her handbag and some develop an almost symbiotic relationship with the bag and its content. Others have a more playful and flirtatious relationship with it. They change their leather or linen companion according to season, occasions or mood. The bag bond can be born when falling in love at first sight of blinking sequin or playful fringes or result from a more rational strategy of comparing sizes, materials and styles. Certain items such as keys, purses and care products can be found in almost every bag, other personal items such as breast implants or a fruit knife might be a surprise to an indiscreet viewer. A bag is a bag but is also unique at the same time: “My bag reflects who I am and what is important to me.” A bag can match your dress – but first of all it matches yourself. Bag owners can be characterised regarding what their bag contains inside and what they express outside, what a bag tells about their personality and their social identity. The ‘mistress of the bag’ is in a power position and in control of her bag and its content. She highlights the non-emotional character of her relationship with the bag and treats her bag as her property that often feels neglected or even maltreated. She doesn’t want to compromise and demands a lot: ““I like to be in control and must admit that I treat my bag like a slave: it’s always with me and has to do what I want it to”. The ‘expressive hedonist’ enjoys her ownership of (often many) bags. The bag represents her style and fashion consciousness – whether in the form of prestigious luxury shoppers or the latest must-have bags. She feels reassured and entertained through her steady companion: “One may understand who I am from both my bag and by its contents. My bag is the mirror of myself”. The ‘capricious passionate’ wants her bag to make her happy and light-hearted. She has a rather flirtatious relationship with her handbag although she might be looking for ‘real love’ in her very heart. She can fancy the pink patent leather shopper during the day and the golden clutch in the evening: “I bought this bag because it makes me feel good”. Every bag has its own character and reflects the character of its owner. A bag is nothing less than a practical container filled with helpful tools and personal treasures and a mobile miniature version of a woman’s world at the same time. The bag is the steady companion who never lets you down, supports you to deal with any eventuality and allows you to either hide or to make you noticed. No wonder women can’t do without it.